Summer has hit the northern hemisphere, and with it comes the search for the ultimate cold coffee experience. Coffee talk switches from where is the best Espresso and Filter Coffee, to where can I get the best Caffe Freddo, Coldbrew, Frappe, Iced Coffee, Espresso on Ice, Shakerato or Affogato. Coffee lovers and freaks know how difficult it is to find that cold coffee that hits the spot. Why? Because there are those that try to hide the cold coffee bitterness by adding spoons full of sugar. Then there are those who add loads of ice thinking that is what cold cold coffee is about. They tend to forget that in warmer weather, the ice melts quickly creating a watery milky coffee disaster. Oh and then there is Coldbrew – not to be mistaken for cold Filter Coffee. We will come back to this one later. Summertime Coffee 101 starts by looking and learning about the great, classic, Caffé Freddo. Name: Caffé Freddo. Also known as Iced Coffee, Cold Coffee (espresso) with Milk. Origins: Let’s credit this one to the Italians. Preparation Method: Now this is where it starts to get interesting. Cafés are starting to create their own recipes and ways of preparing the Caffé Freddo. The traditional way would be for a Barista to prepare their espresso shots, pour them into a bottle and refrigerate. When they are ready to prepare and serve the Caffé Freddo, they first take a standard glass and fill with a few normal ice cubes. 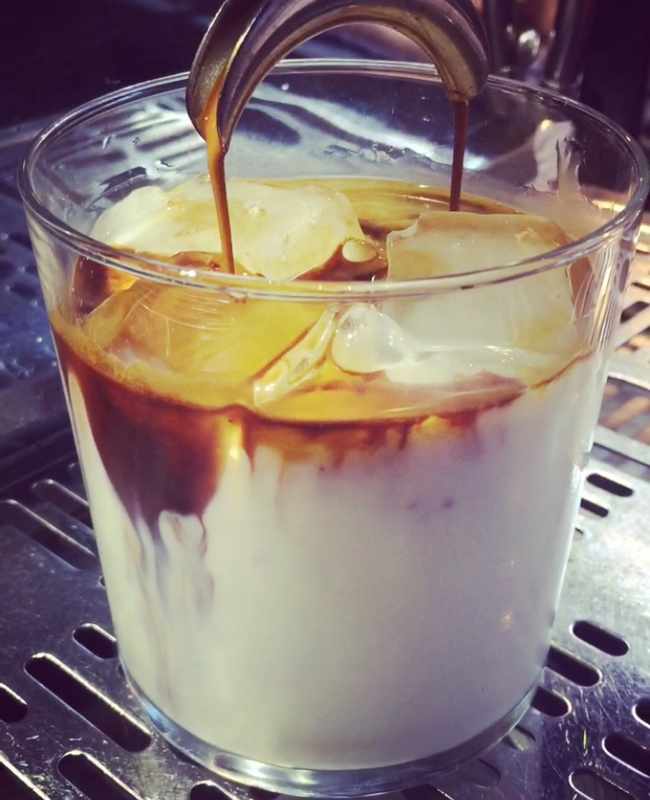 Next, they measure and pour a double espresso over the ice, and finished with some fresh cold milk. The new age way, – well it really depends on the Barista and cafés creativity. Example: Here is an example of the new age way. Barista Michaela is ready to introduce the world to the Kraftwerk Caffé Freddo. The preparation method here is: grab the glass, thrown in some ice cubes, pour the cold milk and then prepare the double espresso shot. The espresso roast used on this occasion was from local roasters Miro Coffee. The Result: The Caffé Freddo was ok. Looks great in the video doesn’t it. Cold, even if the espresso was extracted directly over the ice. The main concern was the ice rapidly melting, adding more water to the drink and wearing down the taste earlier than expected. This is why all cafés are encourage to start making and adding espresso cubes to their Caffé Freddo as part of the new age recipe.